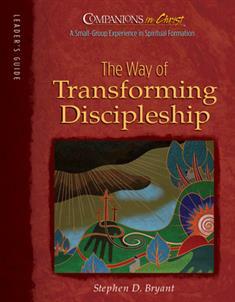 The Way of Transforming Discipleship Participant's Book is also available for small group members. Help your group members become the people God wants them to be. Lead them to reflect on what faith means in terms of who we are, how we must change, how to deal with pain, and how to move toward reconciliation and belonging. Be challenged to live the whole gospel by connecting spirituality and discipleship. "Upper Room Ministries has crafted a practical tool for assisting pilgrims on the journey of transformation," writes one reviewer. "The Way of Transforming Discipleship is for anyone who is on the way to becoming a true Christ-follower. Not only is this a must-read, but even more so, it is a must-do resource!" A group experience of this resource consists of a preparatory meeting, 5 weekly sessions, and a closing retreat. The Way of Transforming Discipleship is appropriate for any group that has completed the Companions in Christ 28-week foundational resource, or it may also be used as an introduction to this powerful program.